Environment friendly, our YTO-LX904CS half-track tractor is equipped with the diesel engine manufactured on the basis of British technology, characterized by big torque, powerful overload capacity and low energy consumption. Besides, our product is quite popular with farmers by virtue of the following features. 1. The (3+1)×4 compound gearbox is consisted of multiple gears, resulting in wide applications on various kinds of soils. 4. This agricultural half-track tractor can be installed with oil separator for powerful lifting force. Moreover, the forced soil penetrating device is optional, as well. 5. The pneumatic brake system and the 1/2/3 groups hydraulic output multiway valve are available according to the actual demand of the customer. 7. 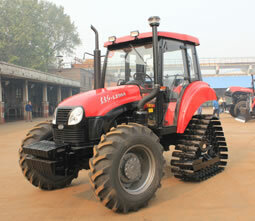 The transfer box and rear track of the eco-friendly half track tractor is interchangeable with that of YTO-X904 series. So it can be used as a wheeled tractor.